The reshuffled Japanese cabinet from August 2017 will remain in place following the LDP’s general election showing. Fresh out of a snap election with a strong and renewed mandate, Japanese Prime Minister Shinzo Abe will retain his cabinet and leave the leadership of the ruling Liberal Democratic Party (LDP) unchanged. In early August, amid dwindling approval ratings, Abe had moved to reshuffle his cabinet, critically introducing new ministers to the important defense and foreign portfolios. Avoiding a cabinet reshuffle at this point allows the Japanese government to retain continuity. The reasons for August reshuffle — scandal, drooping approval ratings, and resignations — are no longer looming large for the prime minister. 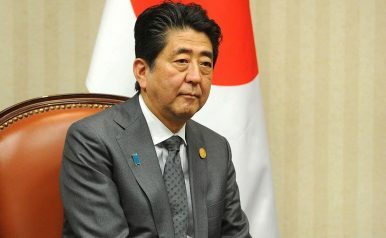 Moreover, with Abe set to be re-elected as prime minister on Wednesday when the Diet convenes for an eight-day session, intra-party challenges to his leadership within the LDP will be muted for some time. The Japanese cabinet, thus, will retain, for example, Itsunori Onodera as minister of defense at a time of intensified regional security challenges, especially from North Korea. Onodera had been replaced by Tomomi Inada for a period of one year from August 2016 to August 2017. Taro Kono, too, will remain in the position of minister of foreign affairs. Hiroshige Seko will continue at the minister of economy, trade, and industry. In a snap election on October 22, Abe’s LDP won 284 out of 465 seats in Japan’s House of Representatives, the lower house of the country’s bicameral parliament known as the National Diet. That showing, along with the performance of its coalition partner Komeito, allowed Abe to retain his position as prime minister. The snap election also took place amid discord in the Japanese opposition, where parties splintered late this summer. Abe justified calling the snap election on the basis of a “national crisis” from North Korea after the country launched two ballistic missiles over Japanese territory in late-August and mid-September. North Korea will be a major feature of an upcoming trip to Japan by U.S. President Donald J. Trump, his first to the country since his inauguration in January 2017. Abe visited the United States in February 2017 for a visit that emphasized North Korea, the U.S.-Japan alliance, and trade and economic relations. North Korea carried out a ballistic missile launch into the Sea of Japan during Abe’s visit to the United States. North Korea has launched 20 ballistic missiles in 2017, with many landing in the Sea of Japan or Japan’s exclusive economic zone in the Sea of Japan. Two Hwasong-12 intermediate-range ballistic missiles have overflown Japanese territory in Hokkaido, overflying major urban areas including Hakodate.